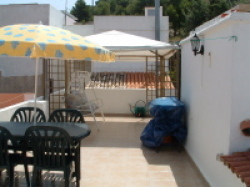 Town house in Oliva near blue flag beaches. View of the spacious rooftop terrace. View of the main double bedroom. View of the second double bedroom. This is appropriate with the vast luscious fertile groves of oranges and lemons. Situated at the Northern tip of the Costa Blanca and the Southern area of Costa Azahar, you will find the busy market town of Oliva. A sweeping bay of mountains to the West and 18 kms of magnificent white sandy beaches to the East. This is without doubt the real Spain! Oliva region is situated on one of Europe�s largest subterranean lakes and the drinking water quality is excellent and abundant. The area is steeped in history where you will be privileged to be able to live and be a part of the real Spain. Just a few minutes walk away will take you back in time as you stroll along the ancient Calle La Hoz. One of the major features is living with the Spanish culture where their love of life is reflected in their friendly, welcoming attitude towards others. The house has been restored keeping many of the original features but with the advantage of modern day benefits. Smoking is not allowed and we ask that for your safety and other guest�s comfort you do not smoke in the house. 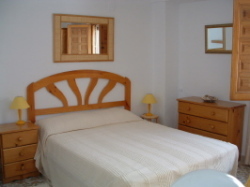 The house is situated in a residential area and during your stay you will be able to meet your Spanish neighbours. There is a spacious roof terrace with barbecue, table and chairs and swing seat, with wide reaching views of the orange groves, the castle, sea and the ancient St Roc Church. To complement this outside living is an attractive inner courtyard with mosaic table and seating for 6. 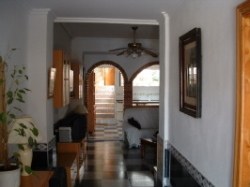 Internally this large comfortable and well furnished traditional townhouse has many lovely features. 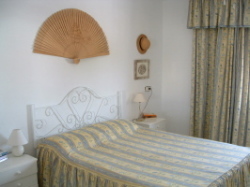 Inside the property offers all the modern amenities that we have come to expect on holiday. All bed linen and house towels, not beach towels, are provided. There is a formal dining room seating 6 people. There is a seperate suite with a double bedroom and en suite bathroom with large corner bath, just right if you need to escape yet just across the courtyard. There is a limited choice of Spanish tv programmes available. You must visit the local market on Friday where locals bring their fruit and vegetables to sell at prices that you would not believe. Do not forget that you buy by the kilo and you may get more than you bargained for!! Many of the nearby towns and villages have markets and of course fiestas. A car would be useful to get around to make the most of the area and all it has to offer. However, transport up and down the coast is possible by bus. Transport to Alicante and Valencia is possible by bus and to Valencia by a combination of bus and train via Gandia.